If asked to make a map, would you write a novel? 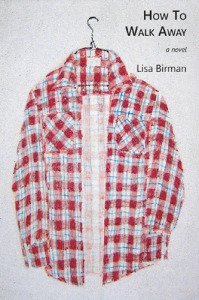 Lisa Birman would and did in How to Walk Away, her first novel, published by Spuyten Duyvil press, February 2015. As a map, this novel is folded in thirds and well worn at the creases—worried over with care. It’s crowded with omission and perspective carrying the reader along to discovery. To finding new pleasure in rare dialogue and the even rarer complete sentence while traversing her anti-hero’s journey. In her poetry Birman uses space and color to expand the dimensions of the page, as in her chapbook For That Return Passage – A Valentine for the United States of America. She brings similar dimensions to her novel—detours into the synaptical maze of Otis, an OCD war veteran returned home and mapping the familiar with the number five. Unlike Campbell’s heroic journey, How to Walk Away starts at the return. Enveloped and interspersed with letter narration, the short and shorter sections of the book craft a psychological domestic journey in three acts from Otis’ isolation to a delayed reunion with his wife, Cat. Birman’s careful structure offers road signs for the reader traveling the confusion of the narrator’s consuming obsessions. We feel the accuracy of the breaches between the internal and external worlds as Otis travels outside himself in the middle of the book. “We do not know our borders. Most people cannot mark their height on a wall. . . . We do not know our reach. The breadth of our bodies.” (148) Manifesting mental injuries physically, Otis’ person becomes not unlike the shape of the novel itself—three thoughtful sections. Cartography builds on the premise that reality can be modeled in ways that communicate spatial information effectively. How To Walk Away is a space effectively communicating two models of reality merging to make a new topography. Lisa Birman proves a deft cartographer as she delineates a shift between the boundaries of Cat and Otis, the continents of the novel. “You can’t always see your patterns. Standing inside them. Looking out. I know there was a space between the noticing and the saying.” (236) When Otis steps outside himself and finds uncharted territory in simple things, a coat, say, or a closet in his home–the coat and the closet become the X marking the spot Cat and Otis intersect. “I don’t know that there is a perfect map. There’s a mapmaker. There’s always a kick back.” (10) Not a perfect map, How To Walk Away is a book to explore. Reading it, “you’ll know something new. Most times you won’t notice. The movement is too swift. You’re just there. Knowing. Or on the road to knowing.” (254) If asked to make a map, would you ask, a map of what? Or would you know that all of us are only interested in navigating each other?